If you are like me at all, part of the great appeal of fall is baking. Yes, I absolutely love the crisp fall air, football, the changing leaves, but I love to bake pumpkin pie, pumpkin bread, pumpkin cookies....are you catching the theme here? But the worst part of baking with pumpkin is the cost of those itty, bitty spice jars of Pumpkin Pie Spice. I mean, REALLY? Just one little jar for a loaf of pumpkin bread is almost $4.00! Is that crazy or what? Finally, I got smart and decided to find a way to make my own. 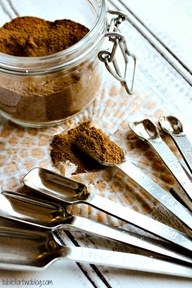 So I did some Pinterest surfing and stumbled across Table for Two's Pumpkin Pie Spice Recipe. Expecially since I'll be sharing LOTS of yummy pumpkin recipes in the next few days. Hey thanks on the link about the pie recipe, it seems interesting!